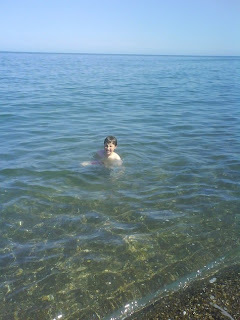 Swimming in the Irish Sea is not for the fainthearted. I should know because I'm fainthearted and the Irish Sea is cold - really cold. How cold? I don't know, but someone I know who has sampled both the waters off Maine and the Irish Sea says the two are about the same. What I do know is it sure ain't summer at Jones Beach or the Jersey Shore. 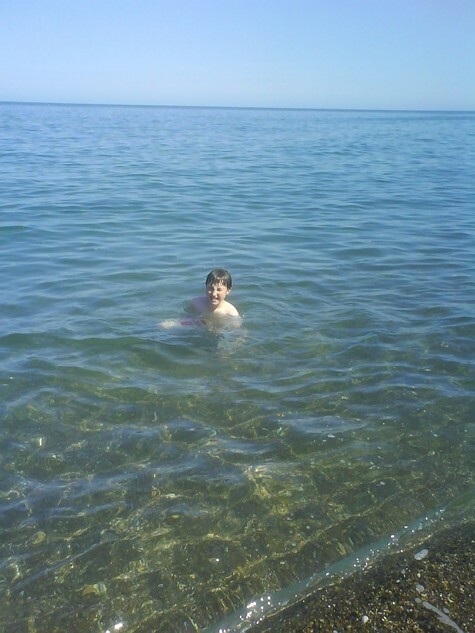 I don't have a temperature for the water at Greystones, County Wicklow, but it's so cold it hurts. Oh yeah, I go in the water, but resignedly, never happily. It's my family's fault. We go through the same routine annually. The weather 'heats up' - hits 70F or so - and next thing, "Let's go for a swim" is being uttered enthusiastically. I run through a series of protests until my wife shoots me that 'for the children' look and I cave. Off I go towards my rendezvous with destiny all the while thinking dark thoughts about how those same children eat me out of house and home. That was the situation yesterday. It was warm, the warmest day of our summer so far. I suspected I might hear the dreaded words, but the fact that two of our three children are away had me hopeful. I was wrong. Just when I should have been eating dinner I was making my way to the sea. Once I get to the water's edge it always takes me a while to get in. Like I said, it's so cold it hurts, but this time even my wife thought it was cold, probably due to the fact that June was absolutely freezing. Yesterday took me longer than normal. Bit by bit I got myself in. After each step along the way to submersion I waited til the pain gave way to numbness. Eventually my entire body was numb at which point I started to enjoy myself. After a few minutes swimming and playing I exited the water only to realize that the sea breeze I'd noted on the walk down suddenly felt pretty sharp. The air temperature was around 65F. It was warm enough to defrost me so I could feel the pain again, but not warm enough to prevent the teeth-chattering, knee-knocking, shivering that lasts about 20 minutes. On the plus side, the water is clean (far as I can tell). I mean, what self‑respecting germ or contaminant would be caught dead in such cold water? When the heat eventually makes its way back into your body you start to feel good about the swim, like you've accomplished something and you've experienced some form of natural beauty. That thought keeps you going right up til the next warm day, when the dread sets in again. Is there no chance of rain today?